In mid-2004 I first started exploring Second Life. Version 1.4 had just been released and Philip Rosedale had said in the press release “My fantasy is to be Uma Thurman in Kill Bill, and now I can. I’d pay $10 for her yellow jumpsuit and sword moves and I’m sure other people would too. Custom Animations are going to liberate the world of Second Life in ways I’m sure I can’t imagine.” Plenty of people responded by making sword fighting moves, but the software and network latency in Second Life made actually having a satisfying sword fight hard, so I decided to play around with Second Life’s scripting language, LSL, to see if I could build an interesting turn based sword fighting game. Once I had a prototype up and running I realized that it might be fun to turn it in to a trading card game and so asked on the Second Life forums if anyone would like to help with the artwork. Osprey Therian replied. I had no idea who Osprey was in real life, but in Second Life she was friendly, funny, enthusiastic, determined and a ball of energy. Together we photographed hundreds of avatars and Osprey turned them in to georgous Combat Cards, she created hilarious custom animations with rotating limbs for our robot themed cards and dozens more to accomodate avatars curled up in to a ball as tinies. We sold thousands of combat cards, made thousands of real life dollars and ploughed some of that in to getting real life Combat Cards printed which we sold for Linden Dollars using a vending machine in Second Life. We built a community that met up every Sunday to play Combat Cards and ran tournaments with every new release for several years in Europa. Much of this was only possible thanks to the way that Osprey threw herself in to the project with an energy, passion and determination and commitment that I have rarely experienced in Second Life or real life. We rarely talked about real life, mostly just meeting up in SL and getting things done. Partly this was because started working for Linden Lab and didn’t want that to affect our relationship. Eventually I let it slip somehow and Osprey confessed that she sort of knew anyway, from various hints and things I’d mentioned over the years. With that secret out we vaguely started making plans to meet up in real life and in 2009 got the chance. While visiting Linden Lab’s Seattle office I hired a car and drove to Olympia where a woman called Vivian Kendall, who I had never met before, let me in to her house and made me a salad. In some ways it was a very strange encounter. I wasn’t a bald, yellow, Simpsons like mad scientist, Osprey wasn’t a rakish, swashbuckling rogue and we weren’t swordfighting, dancing or floating across Second Life in a hot air balloon, but we knew each other. “You’re just you”, Vivian said as we ate together. And Vivian was just Osprey. Much frailer in real life, but full of the same energy and passion that spilled out across Second Life. After lunch we looked at some of Vivian’s real life paintings and although she regretted not being able to paint any more she talked enthusiastically about the second life that Second Life had given her to create and socialize as her real life had closed in. After an hour or so of chatting we took a picture, I left and we went back to our second lives. I only heard about Vivian’s passing a couple of hours ago via Joe Miller and so I unfortunately missed her memorial yesterday, but I am very grateful that I got to meet up with Osprey one last time to celebrate Second Life’s 10th birthday a few months ago. We talked and danced, listened to music and Osprey showed off yet another amazing Second Life avatar that looked incredibly life like until she pushed a virtual button and made her feet enormous. It was perfect. Whenever people claim that Second Life failed I think of Osprey. Second Life allowed many of our lives to be enriched by the wonderful Osprey Therian and provided her with a platform for her creativity when painting in real life became impossible. That is success enough for me. 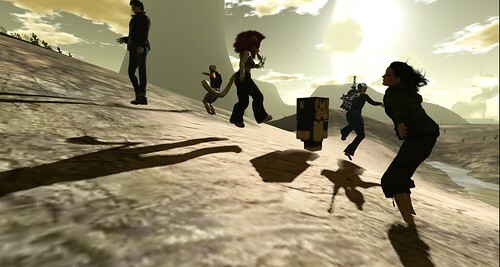 But Second Life was just the platform: the art, energy, love, creativity and passion were Osprey’s alone. I will miss her enormously and remember our time making Combat Cards together forever. A great video of the Brighton Mini Maker Faire last year by Andrew Sleigh showing the making of You’re The Boss 2. Applications for this year’s Maker Faire are now open and I can’t wait to see what everyone comes up with this year! At the recommendation of John and Alice I took a break from Develop Online to listen to Jon Blow‘s talk at Games:Edu this week and was totally blown away.